Card Benefits | ANA CARD U.S.A. - You can earn 5,000 Bonus miles! 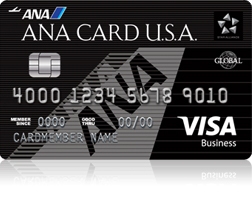 ANA recommended credit card for employees relocated to the United States. This credit card is available only to ANA Mileage Club members with a U.S. address and is ideal for employees relocated to the United States with little to no credit history	in the United States. Entirely U.S. dollar based, and an opportunity to build credit history in America. You will receive 5,000 bonus miles for your first qualifying purchase using ANA CARD U.S.A.
ANA Mileage Club regular members with ANA CARD U.S.A. (Primary holder) are now qualified for 25% Flight Bonus Miles as Card Type Multiplication rate, when flying on ANA Group flights. Please see the details on the ANA website. Note: When using the simulator, please choose ANA Card Gold as the card type. when ANA Premium members (Diamond, Platinum, Bronze) fly with ANA Group and/or United Air operated flights, Flight Bonus Miles ratio will be increased by 5%. Note: This offer is only valid when primary cardholders earn ANA miles on ANA Mileage Club. Note: This offer is valid even if you don't use the ANA Card U.S.A. to purchase flight tickets. Note: Bonus miles may take up to 6 weeks from card issuance to reflect in your account. ANA CARD U.S.A. Primary card holders who earn 30,000 premium points or more within one year will be qualified for ANA Bronze Service membership status even if they do not meet the 15,000 points requreiment for ANA Group operated flights. Premium points are recorded separately from ANA miles. Enjoy Priority Check-In on ANA-operated International Flights! To receive this benefit, present ANA CARD U.S.A. at the Business Class check-in counter. Receive a 10% discount on all ANA in-flight purchases for international and domestic flights when using your ANA CARD U.S.A. Note: Discount applied only up to 200,000 yen for international flights and 85,000 yen for domestic flights. Shopping on code share flights operated by other airlines are not eligible. Note: In order to ensure the security of your ANA CARD U.S.A. credit card, when you make an in-flight purchase, the cabin attendant will match your signature on the back of the credit card to the purchase receipt. If the cabin attendant is unable to verify your signature or if there is no signature on the back of the card, the purchase will not be approved. Present your ANA CARD U.S.A. when checking out at the following ANA group duty free stores in the airport, and receive a 10% discount on selected items. Note: Some exceptions apply, such as CHANEL and Shiroi Koibito. • You will also enjoy a free breakfast and welcome drink during your stay at an ANA Hotel, if you use the discount for members noted above. (*1) Discount may not apply to certain stays. Note: Payments must be made with cash or ANA CARD U.S.A. at the front desk. Note: These discounts cannot be combined with other discounts, offers and IHG ANA Hotels Group Japan Coupons. Note: "The Welcome Drink service" is applicable only at domestic ANA Hotels Group Japan and is limited 1 drink per stay. The designated drink and place(or lounge) may be different in each hotel. >ANA Hotels and IHG・ANAco-branded hotel home page. Present your ANA CARD U.S.A. and you will receive a 5% discount on selected items at "ANA FESTA" gift shops operated by ANA Trading Co. at airports in Japan. Note1: The discount is not applicable when total amount is under JPY 1,000 including taxes. Note2: You may not use other coupon when the discount is applicable. Note3: The discount is not applicable for some items of postal items, books, alcohol, tabacco, and a coffee of Starbucks shop in ANA FESTA. You can enjoy a variety of benefits such as special discounts, services and bonus miles with AMC partners throughout the United States. Please enjoy the unique network provided only by ANA. You can check your FICO score for free by just logging on to your online banking. Note: To build credit history in the U.S. you must register your social security number with us. FICO® is a registered trademark of Fair Isaac Corporation in the United States and other countries. Please note that new cardholders will generally see their FICO® Score about 2 to 3 months after account opening. Note: You must be 18 years old or older to apply for the card. Authorized users also must be 18 or older. The card is issued by First Bankcard®, a division of First National Bank of Omaha, pursuant to a license by Visa U.S.A.Inc.VISA and VISA SIGNATURE are registered trademarks of Visa International Service Association and used under license.